The Altissimo red rose was first bred in France in 1966 by contemporary breeder Georges Delbard who is most known for breeding roses with large blooms for cut flowers. This variety was first introduced to the UK by its given name in 1966. 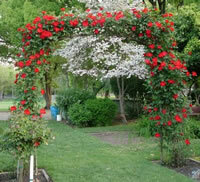 The Altissimo is a great climbing rose that can grow anywhere from 7 feet tall, all the way up to 15 feet or more. While it is not as well known as some other climbing red roses, the Altissimo's large red blooms are sure to make it a favorite of anyone who grows it. 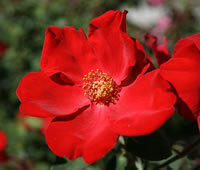 Climbing Altissimo roses are a great choice for the novice and experienced grower alike. The plant is hardy in zone 5 and warmer and it has excellent disease resistance qualities which make it very forgiving to inexperienced gardeners. It is also tolerant of partial shade locations, which is fairly uncommon among most types of roses. The Altissimo red rose is very versatile in the garden and can be trained to grow up just about any support, or it can be pruned back each season and trained to grow as a shrub. Altissimo red roses will provide you and your garden with endless flushes of large, abundant red roses throughout the entire growing season if properly cared for. The blooms will be mostly single flowers averaging about 5 inches in diameter with about 7 petals or so per bloom. The fragrance is mild and subtle, but will have a nice clove scent to it. This particular variety will have quite a few thorns growing along the stems and canes, so make sure that you handle this red beauty with gloves on. 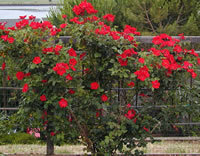 You should have no problems finding a home for climbing Altissimo roses in your garden. While it can do well in partial shade locations, roses in general will give their best performance if you choose a location that gets a lot of sun light. A minimum of 6 hours each day will suffice, but the more the better. Roses also need soil that is well drained, so if you are considering a spot that tends to stay damp in between rains or waterings, that is perhaps not the best location for your Altissimo red roses. Ideally you want a spot that will hold the moisture long enough for the plant to absorb it, but not so long that it begins to rot out the roots. Planting your Altissimo red roses just might be a lot easier than you thought it would be. Depending on where you purchased your roses from would determine how you received them. If you bought them from a local nursery, they most likely came in a 2 gallon or so container. What you want to do is dig your hole about twice the diameter of the container they came in, and equally as deep so that the bud union maintains the same depth below the surface of the soil. If you ordered your climbing Altissimo roses online, then you probably got them as a bareroot plant and that only requires just a little more thought into planting. You will need to dig yourself a hole that is wide enough to accommodate the roots without having to fold them over to fit the hole. You also want to dig the hole deep enough so that the bud union will rest about an inch or two below the soil. When determining the depth, keep in mind it's a good idea to mound up some soil in the center of the hole so that the roots can naturally angle downward once you backfill. Speaking of backfilling, this is a great time to discuss soil amendments. One thing I've learned over the years is it doesn't matter how good you think your soil is, it can always be better. Before I do any planting in my garden, I always make sure I have a bag of organic compost from the local garden center. Not only is this stuff cheap, but if you mix it 1 part compost to 2 parts soil, you are really going to give your plants an added boost that they wouldn't otherwise have. Caring for your Altissimo red roses is a piece of cake and even new gardeners that have never grown roses before can certainly learn how and pick up the tricks. The most important thing is getting your roses on a regular watering schedule. In most climates, you can give your roses a good thorough watering each week, provided Mother Nature isn't already doing the job for you. The best way you can tell if your roses are dry is to stick your finger down into the soil. If it comes out damp then the soil is still retaining water and you don’t want to add any more to it. 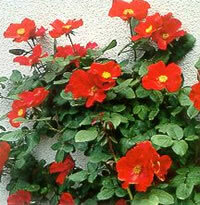 The other consideration is fertilizing your climbing Altissimo roses. Now there are a number of rose food products on the market, but I prefer to use an all-purpose granular fertilizer over the liquid chemical fertilizers. In my experience, the liquid fertilizers too easy burn some varieties of roses so I find it best to just stay away from them altogether. Why make the job harder than it has to be right? Most roses do well if they get fertilizer in the early spring, just as the leaves begin to form. Now many varieties are repeat bloomers and it is perfectly ok to give them additional feedings over the growing season. You can give the second feeding to your climbing Altissimo roses just as the first big bloom is developing. The 3rd feeding can be applied later in the summer, typically around mid-july or so. Just make sure you follow the dosage instructions on the product and always leave at least 4 weeks in between each feeding or you risk overdoing it and causing more harm than good.